In order to provide ready-to-hang art in additional sizes, I have modified my offering as shown below. These prints arrive ready-to-hang with picture hanger included. 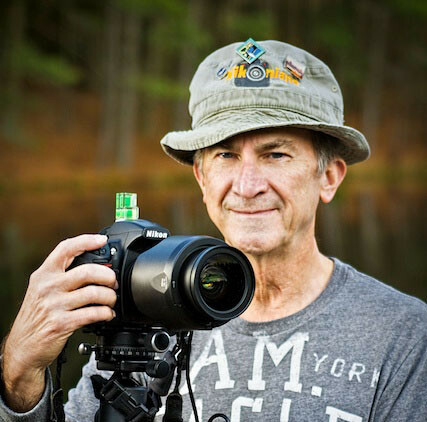 I do all of my own printing, mounting and packaging for shipment. 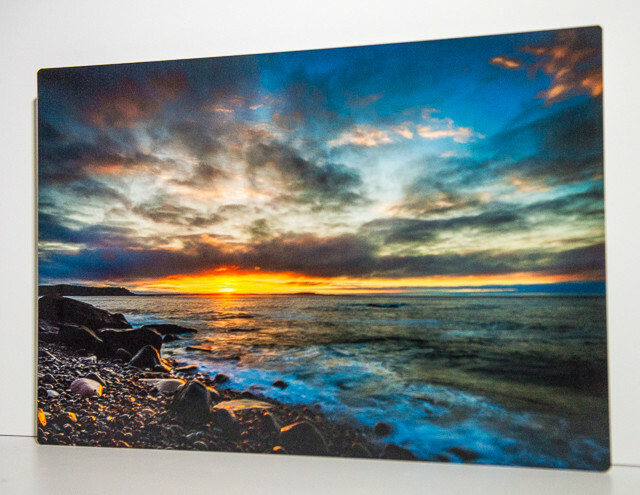 3 sizes (18x12, 24x16, 30x20, LxW) printed on aluminum. 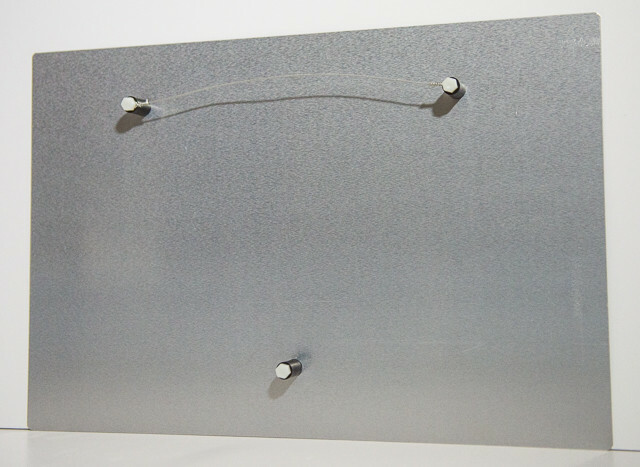 Gator Board, also known as Gatorfoam, is the industry's leading heavy-duty foam board. Instead of foam board's paper surface, Gatorfoam is comprised of a wood pulp impregnated with plastic surface. The wood fiber veneer provides a high structural strength. 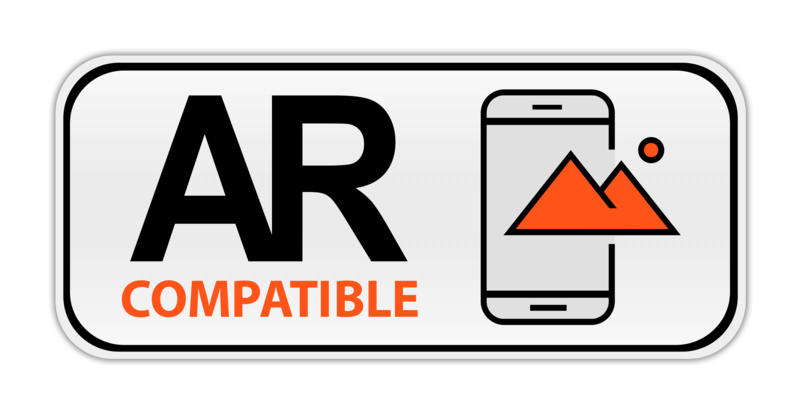 It is lightweight, extremely durable and long lasting. I purchase 1 inch thick gatorgoard, cut to the sizes I use (24x16, 30x20, 36x24), with a black finished edge (see finished print below), which hides the foam. into the back of the Gator Board and glued to prevent moving around (see image to left). 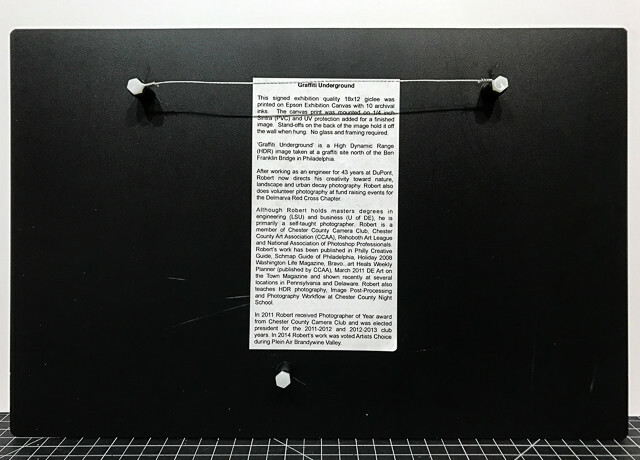 Plastic-coated hanging wire is attached to the eyelets for hanging the print. The back of each print also contains information on how the image was printed, where it was captured as well as my bio information. 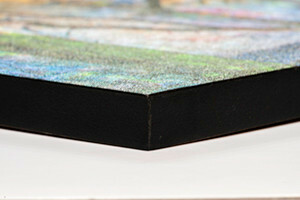 The image on the right shows the black finished edge which covers the foam center of a canvas print mounted on Gator Board. The prints are carefully packaged for shipment and arrive ready to hang. on thickness) and well suited for mounting photographs. I purchase pre-cut sheets in smaller sizes (15x10, 18x12) than Gatorboard in order to expand my offering on the lower end. 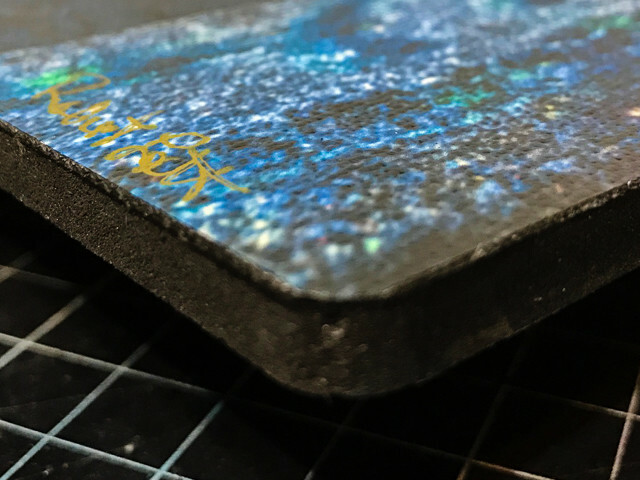 The canvas prints are glued onto 3mm (~1/8 inch) or 6mm thick (~ 1/4 inch) black Sintra® & have UV protection applied (see image to right). 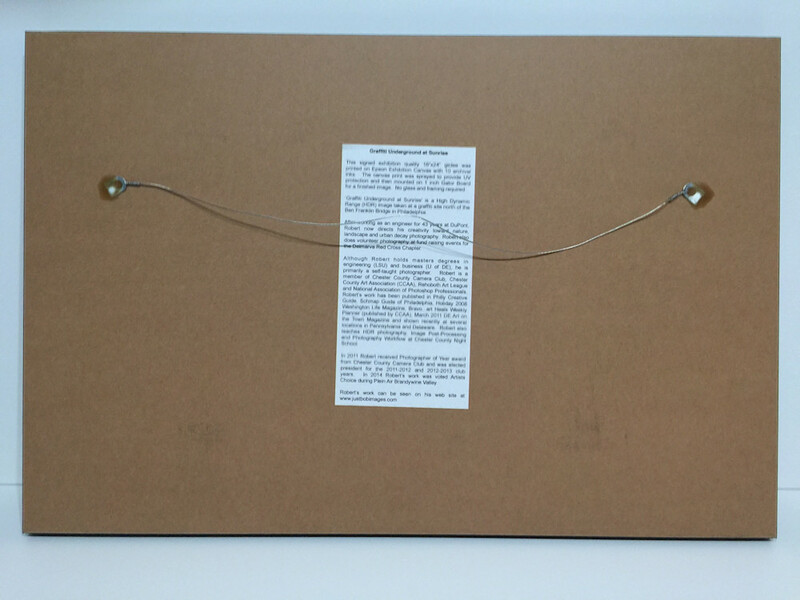 For hanging purposes, I use 3 standoffs glued to the back of the Sintra® sheet (see image below) with hanging wire attached to the top 2 standoffs. The back of each print also contains information on how the image was printed, where it was captured as well as my bio information. way to the edge so the sheets have to be trimmed. The current offering from Breathing Color is a matte finish, so they are laminated with a glossy film with UV protection added to protect the print as well as provide depth. The laminated prints are then trimmed to eliminate the unprinted border. For hanging purposes, I use 3 standoffs glued to the back of the print with hanging wire attached to the top 2 standoffs. The back of each print also contains inf ormation on how the image was printed, where it was captured as well as my bio information. 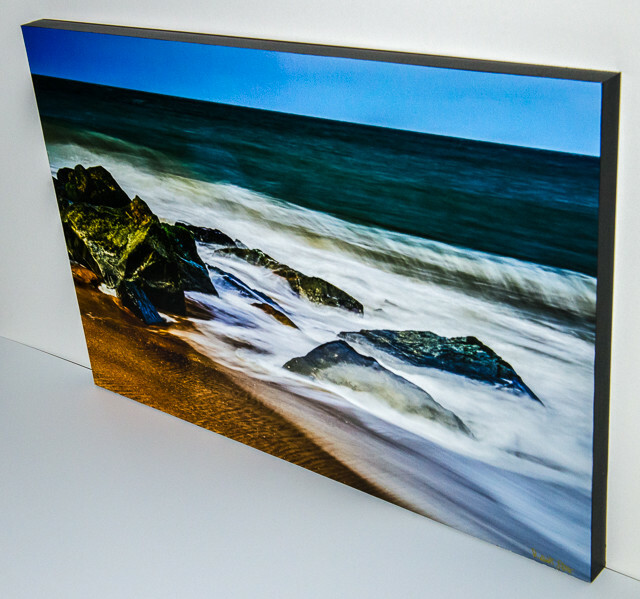 Face mounting to plexiglass requires a very smooth print, not possible with canvas and other fine art papers. For face mounting I am printing on 11 mil polypropylene, purchased from Lexjet, which is very smooth. The print is laminated with film containing adhesive on both sides. The laminated print is then laminated onto 3 mm Plexiglass®. Stiffening of the face mounted print is provided by a layer of 3mm pvc, which is coated with an adhesive. For hanging purposes, I use 3 standoffs glued to the back of the pvc with hanging wire attached to the top 2 standoffs. The image to the right shows an end-view of the image. Looking closely, you can see the thin white line (i.e. the edge of the print) between the plexiglass® on the left and pvc on the right. You can also see the three stand-offs & hanging wire on the back of the image. The back of the face mounted prints contain information on how the image was printed, where it was captured as well as my bio information. The prints are carefully packaged for shipment and arrive ready to hang.